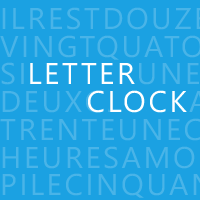 ‘Letter Clock’ is a clock with no hands and no numbers, just words. Time is displayed by highlighting appropriate words as each minute passes. The clock is available in english (formal and popular) and in french.